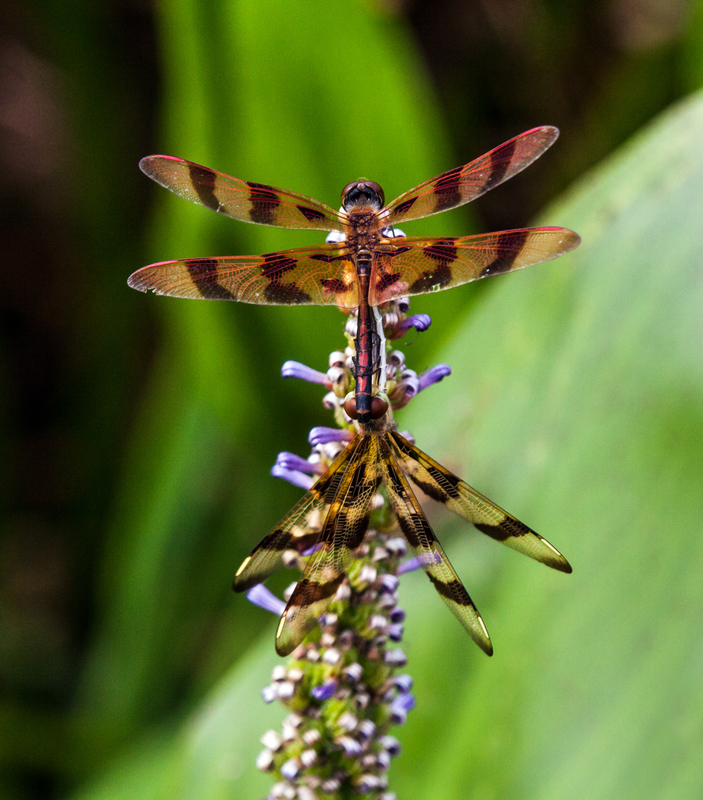 The biological clocks of some species seem to be ticking as the summer winds down, compelling them into frantically mating sessions, like this pair of Halloween Pennant dragonflies (Celithemis eponina) that I spotted this past weekend at Lilypons Water Gardens in Adamstown, Maryland. The challenge in photographing this type of activity is to present it in a way that is artistic rather than purely sexual. 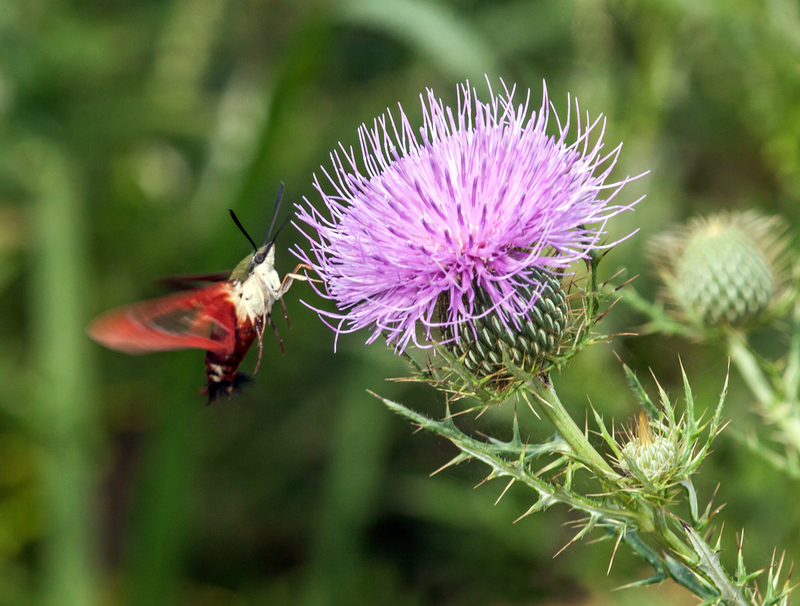 Whenever I see bees buzzing around flowers, I keep an eye out for hummingbird moths. For some unknown reason, I have seen more of these colorful moths this summer than in past years. 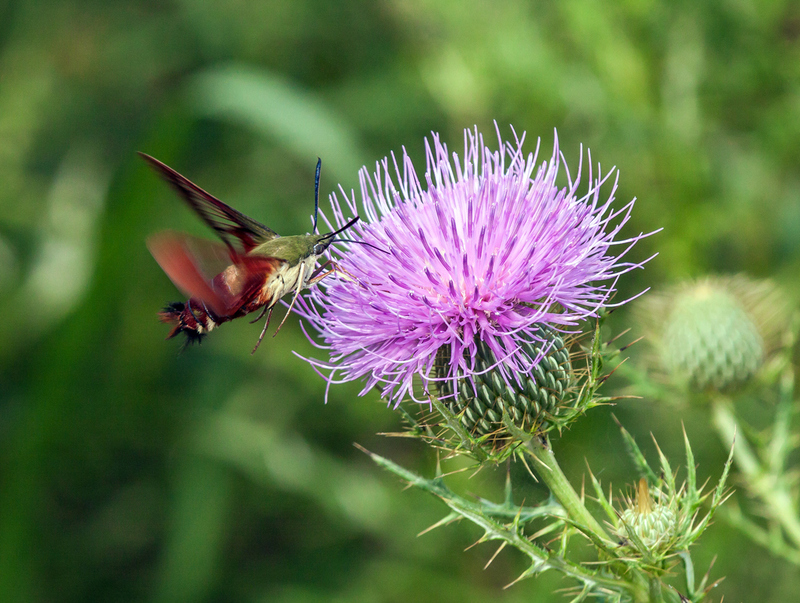 Although you could argue about whether or not thistles are flowers, my vigilance was rewarded when I spotted this beautiful Hummingbird Clearwing Moth (Hemaris thysbe) feeding on this thistle bloom on Monday at Occoquan Bay National Wildlife Refuge. As summer begins to wind down for those of us in the Northern Hemisphere, some of the dragonfly species in our area are starting to disappear. Fortunately, though, some new species appear late in the season to take their places, like this Russet-tipped Clubtail dragonfly (Stylurus plagiatus) that I spotted yesterday at Occoquan Bay National Wildlife Refuge in Woodbridge, Virginia. Unlike many of the dragonflies that I see regularly that seem to prefer pole-like perches or perch flat on the ground, Russet-tipped Clubtails like to hang from the leaves of vegetation either at an angle, as this one is doing, or vertically. I was pretty excited to find this dragonfly, because I have seen a member of this species only once before, last year at a different location, Jackson Miles Abbott Wetland Refuge. 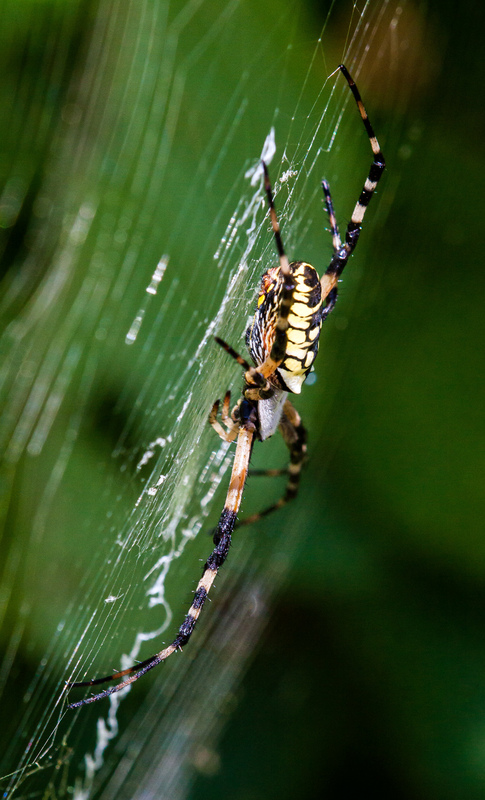 “Beautiful Spider”—I know that some people would consider that an oxymoron, a contradiction in terms. 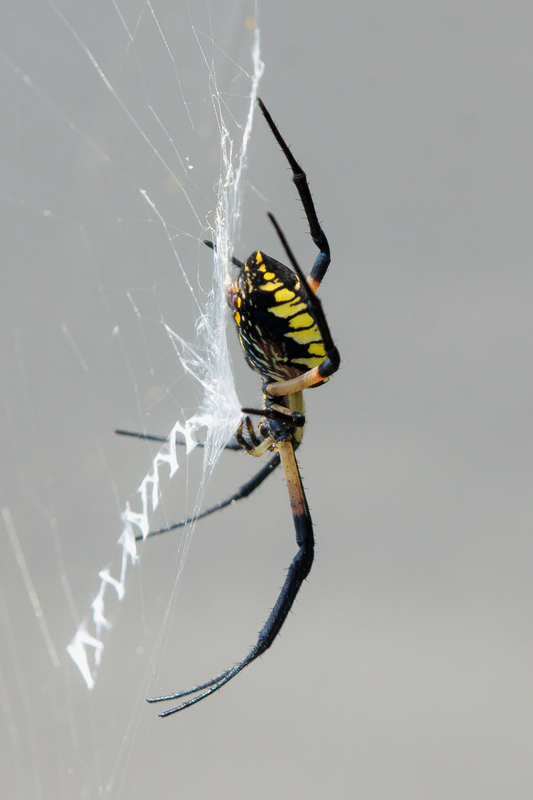 I, however, am fascinated with spiders and photographed this Black and Yellow Garden Spider (Argiope aurantia) at Jackson Miles Abbott Wetland Refuge as carefully as if I were doing a beauty shot in a photo studio. The spider had constructed her web on some vegetation overhanging a small pond, which is why I was able to get such an uncluttered gray background. Earlier this month I captured an image of a spider of the same species while exploring Occoquan Bay National Wildlife Refuge—this seems to be the prime season for these spiders, which I have seen at multiple locations. This image shows well the amazing reach of the spider’s amazingly long legs and, as was the case in the first image, shows the ziz-zag portion of the web that is associated with this species. 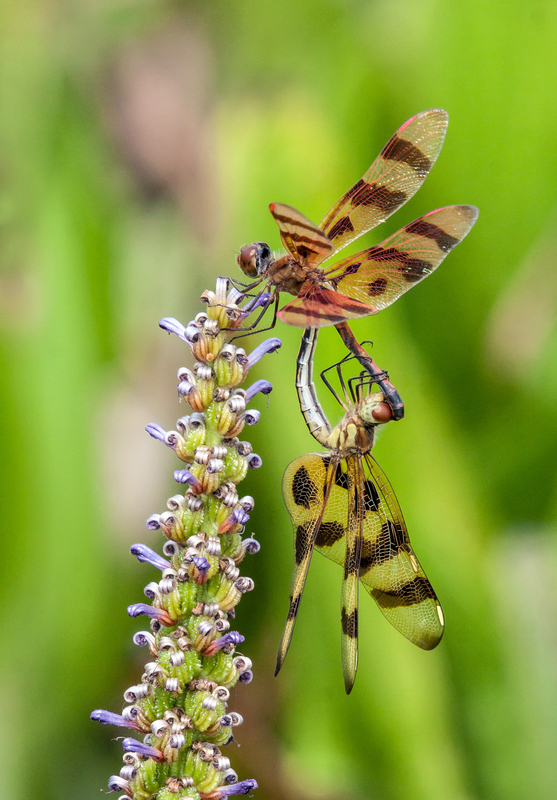 When it comes to dragonflies, what catches your eye? Is it their bright colors or their acrobatic flying skills? When it comes to male Twelve-spotted Skimmers (Libellula pulchella), it is definitely the bold brown-and-white pattern on their wings that irresistibly attracts me. 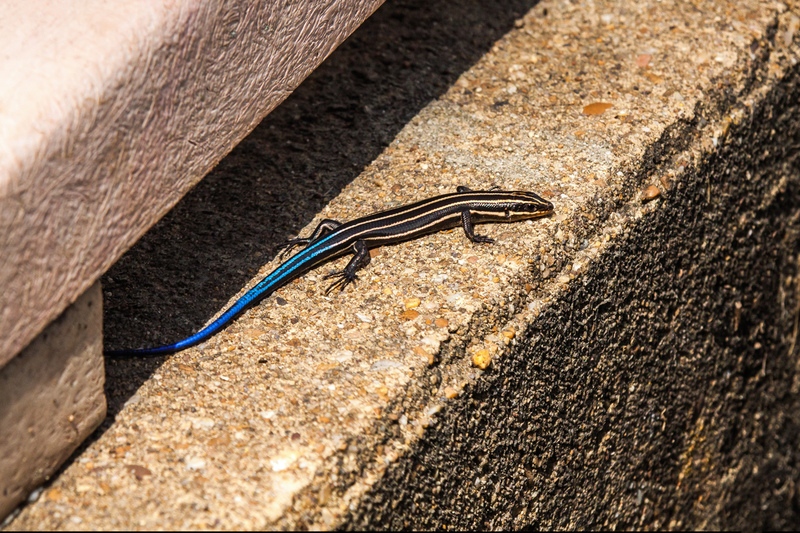 I somehow feel compelled to chase after one whenever I spot it. Yesterday I made a brief trip to Lilypons Water Gardens in Adamstown, Maryland. This sprawling facility has over 150 acres of amazing ponds and water gardens with fantastic displays of water lilies, which are for sale. (I’ll feature some of the different colored water lilies in an upcoming post.) 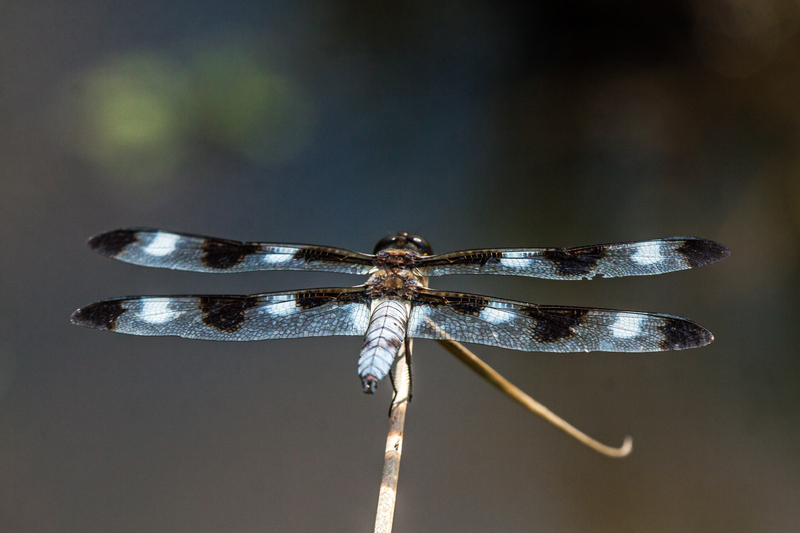 Although I saw a lot of dragonflies there, I saw only a few Twelve-spotted Skimmers. Most of them were remarkably elusive, but one finally perched on some vegetation overhanging the water. 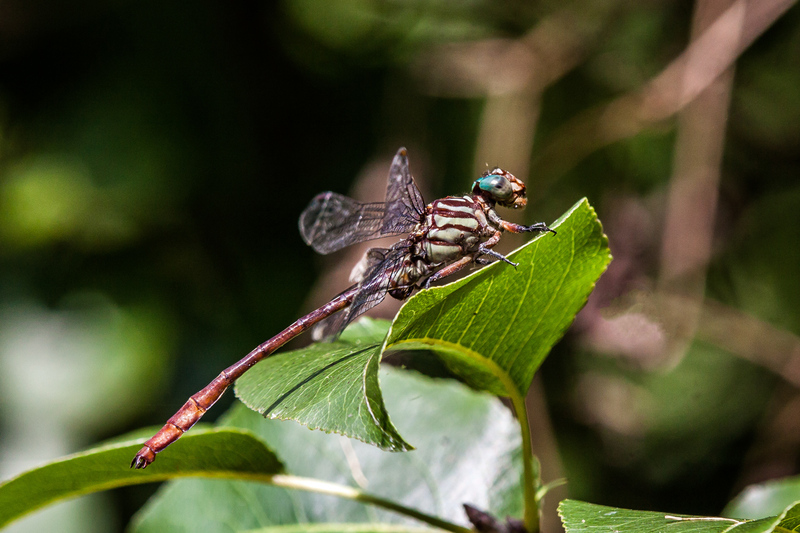 The bank was fairly steep, so there was no way that I could get a side shot or a head-on shot, which is one of my favorite shots of a dragonfly. What was I going to do? Then it dawned on me that I had a perfect view of the magnificent wing patterns as I looked straight down the body of the dragonfly, facing in the same direction that he was facing. Boldly I decided to commit what is normally a cardinal sin for a photographer—I intentionally chose not to focus on the subject’s eyes. Lightning did not strike me as I pressed the shutter and I captured an almost abstract portrait of the dragonfly. For me, there is a real beauty in the simplicity and minimalism of this image. 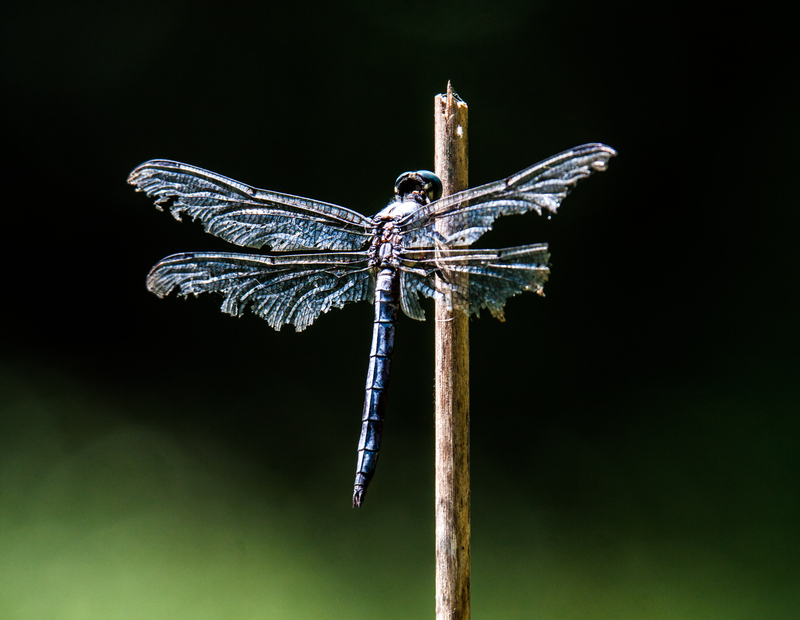 As the days of summer gradually wind down, I can’t help but notice a significant amount of wear and tear on the bodies and especially the wings of some of the dragonflies and butterflies that I see. Clearly it has been a long, tough season for some of them. Despite its tattered wings, this male Great Blue Skimmer dragonfly (Libellula vibrans) that I spotted on Monday at Huntley Meadows Park seemed to have no trouble flying, though I suspect that his days are numbered. I hope that all of you have managed to survive this season well and that your “summer wear” refers to your clothes and not to the condition of your body.